Every year we celebrate the Feast of Vartanantz (Վարդանանց տօն, Vartanantz don) on the last Thursday before the beginning of Great Lent, which falls sometime from early February to early March. 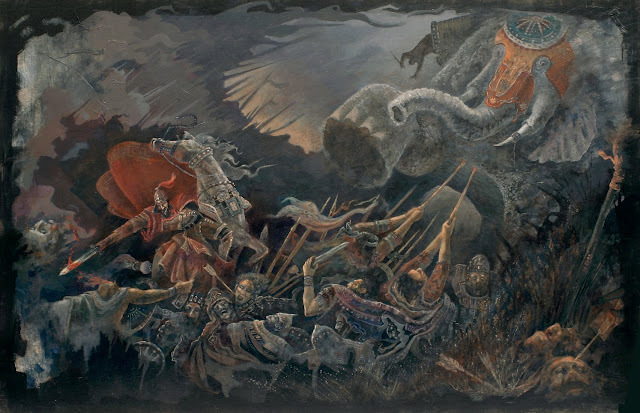 Yet, it is traditionally accepted that the battle of Avarayr, which symbolized the ultimate sacrifice of Armenians in defense of their faith, was fought in May (some sources say June 2) and not in February or March. The reason for the change was ritual. The actual date of Avarayr fell between Easter and Pentecost, and no other saints—the fallen in the battle were canonized by the Armenian Church—could be celebrated in that period of time. The kingdom of Armenia had been divided since 387 between Persia and Byzantium, becoming a vassal state of the Persian Empire. The ruling Arshakuni (Arsacid) dynasty came to an end in 428 with the deposition of the last king, Artashes IV, by the Persian king Bahram V, who belonged to the Sassanian dynasty. This action legally established Persian authority through a Persian governor. Armenia would not have a king for the next four centuries and a half. While Armenians were initially allowed to freely practice Christianity, the situation changed drastically after Yazdegerd II (called Յազկերտ/Yazkert in Armenian) became king of Persia (439-457). In the late 440s, the new sovereign was concerned with the situation of the Armenian Church, which was within the orbit of the Orthodox Christian Church, aligned with Rome and Constantinople, rather than the Nestorian Church, which was Persian-backed and followed the teachings of Nestorius, which had been condemned as heretical by the ecumenical council of Ephesus in 431 (the third and last ecumenical council recognized by the Armenian Church). He tried to force the Armenian Church to abandon Rome and Byzantium in favor of the Nestorian Church or either to compel conversion to Zoroastrianism, the official religion of Persia, which was rather preferable for him. He summoned the leading Armenian nobles to Ctesiphon (called Տիզբոն/Tizbon in Armenian) to convince them into following his way. On the other hand, he sent Zoroastrian magi (priests) to Armenia, who made attempts at demolishing churches and building fire-temples, with Persian troops backing them, as well as replacing Christian clergy. However, Yazdegerd’s policies backfired, as they created a Christian rebellion. A mass revolt broke out when news about the Armenian nobles being compelled to convert into Zoroastrianism reached Armenia. Upon their return to Armenia, the nobility, led by the supreme commander of the Armenian army, Vartan Mamikonian, joined forces with the rebels. An attempt to obtain Byzantine aid was unsuccessful, and the Armenians had to face the Persian repression alone. The Armenian-Persian confrontation took place on May 26, 451, in the plain of Avarayr, southeast of the currently Iranian city of Maku, which was part of the region of Vaspurakan at the time. The Armenian army, composed by veteran soldiers and popular battalions, was said to be 66,000-strong, while the Persian army, including war elephants, was said to be three times larger. Some Armenian noblemen, led by Vasak Siuni, went over to the Persians. During the battle, Vartan Mamikonian won initial success, but was later killed with eight of his main officers. In the evening, the Armenian troops retreated. However, the Persian victory had been extremely costly, and their losses (3,544) were also said to have tripled Armenian losses (1,036 men). Following his victory, Yazdegerd exiled Armenian Catholicos Hovsep I and some of the more recalcitrant priests, and jailed some nobles, appointing a new governor for Armenia. However, he did not follow up with his plans. Vartan Mamikonian was raised to the status of national hero; the 1,036 men fallen in battle were canonized by the Armenian Church, and Avarayr was turned into a moral victory. By a strange coincidence of history, a “second Avarayr” or a “new Avarayr,” as it is frequently called, was fought and won on May 26, 1918: the battle of Sardarabad.